It’s always the same question. My friend Dave was over and had finally noticed the beverage coaster on my coffee table. Like an echo I constantly hear resounding in my mind as a collector, there, again, was that what is this thing? Dave was holding a 5″ silver aluminum medallion I’ve had for many years. I had no answer. I didn’t know. It is most intriguing, and those are the type of the collectible items I hang on to. Mystery pieces are always the most fun to have. If no famous writer ever said “There’s a story in everything,” then one should have. As just a quirky collector with a website, let me say it now. Just by pure chance and coincidence, I now live just a few miles from Columbia, Pa. A few years back, I had looked up the manufacturer and found they had moved their foundry to Mount Joy, Pa, in 1969. So, by the makers mark, I was sure this medallion was made prior to 1969. It turns out I was right. I had driven this mystery medallion over to Wilton Armetale in Mount Joy back in 2009 and happened to encounter the owner, Steve Wilton, as I walked in. Steve was very friendly and helpful. No, he had no records on who may have commissioned these. 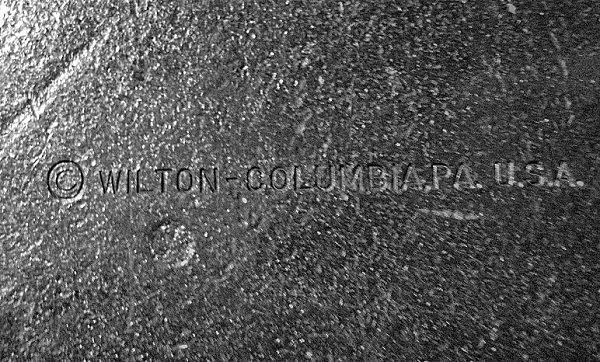 Yes, it was made in his Columbia foundry prior to 1969. Yes, he was fascinated so much he took photos of it on his cellphone. Yes, that’s all I was able to learn. So, back on the coffee table it went. Another mystery to lay about amongst a few others. And it does make a good coaster. My friend Dave, however, had re-piqued my interest in this piece. Note the buildings represented on the medallion. First off, one would think they appear to be representations of the Sears Tower. But how could that be? The Sears Tower wasn’t completed until 1973. The shorter building, referred to as 311 South Wacker, was completed in 1990. So, what buildings are represented on the medallion? 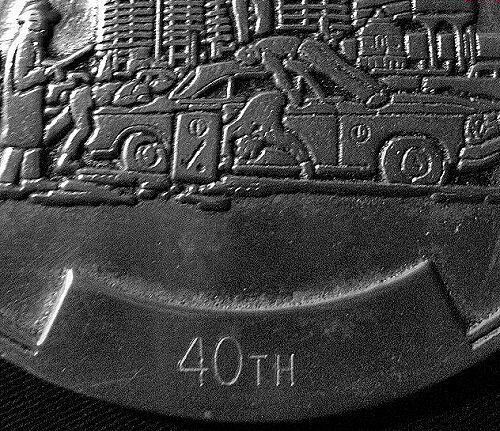 Looking at the timeline, the “40th” on the medallion, engraved privately, after it was made, undoubtedly represents 1969 as it was 40 years after 1929. The other 2 medallions were engraved 38th and 39th, representing both 1967 and 1968 respectively. The owner of the company that made these, Steve Wilton, stated these were made prior to 1969. 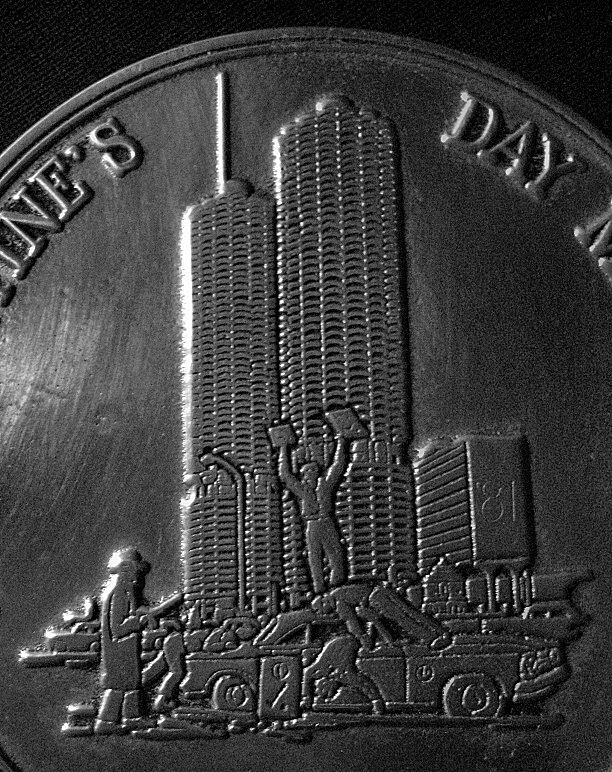 So, that being the case, the buildings on the medallion are definitely other, older, buildings in Chicago. But which ones? 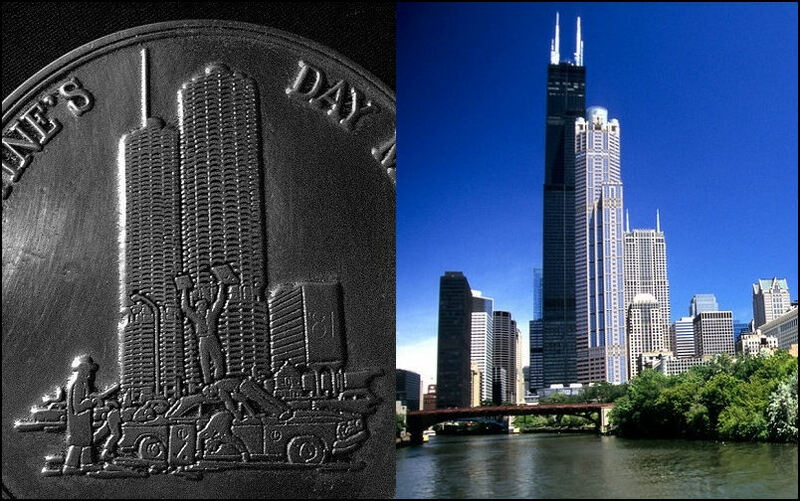 In the upper comparison photo, take a look to the left of the Sears Tower and right in line with the center of the bridge are 2 very similar darker buildings that very well could be the ones illustrated on the medallion. Note the whole massacre scene on the medallion has been fictionalized. It is nothing like what happened that horrible day inside a garage in 1929. Why is an early 1960’s car used to represent the crime scene with bodies both in and on it? The only original likenesses I can see are, one; the gunman has a heavy coat on as it was only 18 degrees and snowing lightly that day, and, two; his gun is strikingly similar to the Thompson, or ‘Tommy’ machine guns used in the shooting. What about some other mysteries. Why is there an “Extra!” type newsboy on the car roof holding up what appear to be headline newspapers? And what to make of a most interesting clue of all? Note the CP with a check mark and period on the car itself. It’s also on the side door, or on a sign in front of the side door. It’s appears again for a third time on the paper the “Newsboy” is holding in his left hand. Could the CP stand for the Chicago Police? If it stood for Al Capone, wouldn’t it read AC? Does the check mark indicate some type of job was completed and “Checked” off? 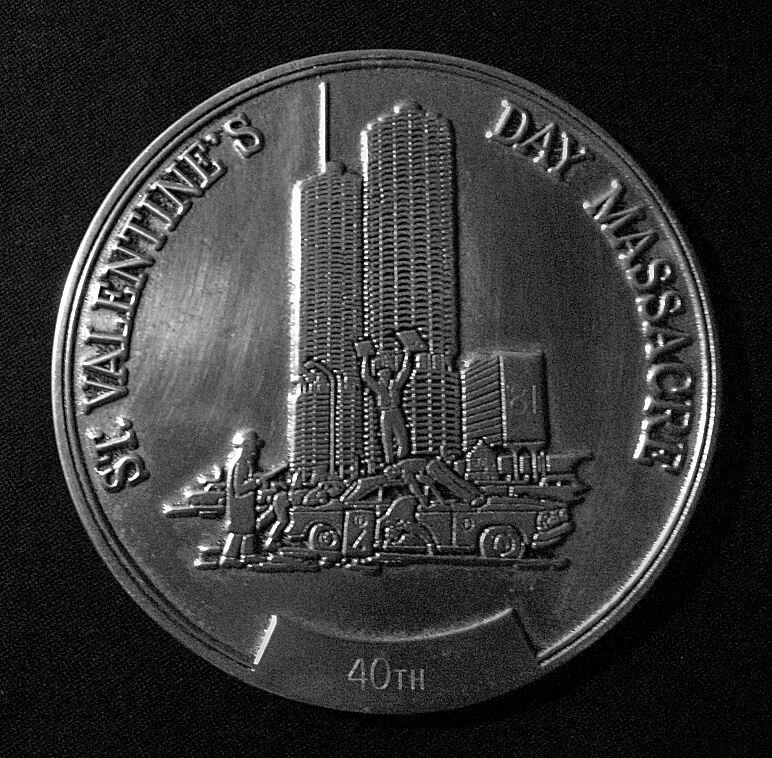 This is the real clue to the medallion and, when looking further into the St. Valentine’s Day Massacre itself, becomes most thought provoking, especially if this “CP” does indeed represent the Chicago Police. It happened very fast. A black car pulled up and four or five men entered the garage. Two were dressed as policemen. 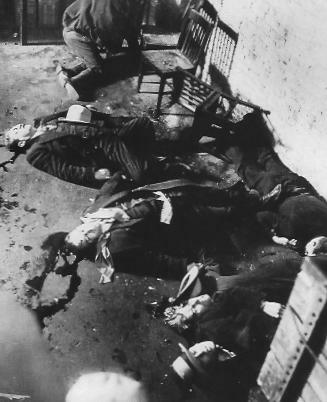 The seven men inside were quickly lined up facing a brick wall and gunned down with two Thompson machine guns. A twelve gauge shotgun finished off any still moving. The shooters quickly left. Witnesses stated that it appeared as if the two dressed as cops were leading the others out, seemingly to appear if they had caught the men responsible for the loud shootings just heard. The black police-like car sped away in the light coating of snow, leaving behind quite a bloody scene. The address was not a Bugs Moran gang get together location or hang out, it was just a repair garage he rented for just that purpose. A sign on the front read SMC CARTAGE CO. 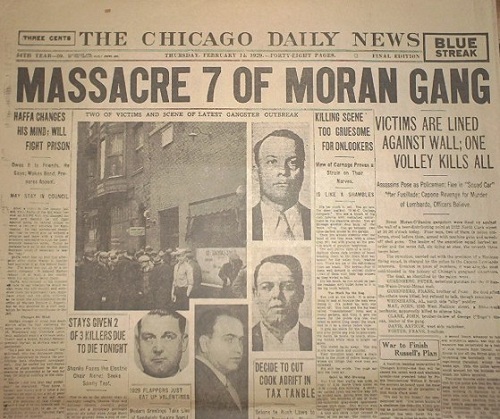 The shooting seemed, at first, to be the usual prohibition style turf war or hit against seven members of the George “Bugs” Moran Northside Irish gang in Chicago. But it also seemed a bit more than the usual hit, as seven members were lined up facing against a brick wall in a garage and gunned down without even managing to fire off even one of their own weapons. Gunned down to the point of overkill. All bodies had at least 9 bullets in them or more. That was a bit odd. Especially when their bodies were found with thousands of dollars on them. Wouldn’t the enemy hitmen at least try to recoup their losses if indeed this was a ‘hit back’ against a heist of liquor or goods? Or, at the very least, roll the bodies for cash? Was it a gang hit or a shooting of blind rage revenge? Two of the seven weren’t even really “gang” members. John May, who was only a mechanic for Bugs Moran had been working under a truck and had his dog Highball leashed to it. Not well dressed like the other six, he was wearing mechanic’s overalls. (Highball survived unshot.) Another victim, an optometrist named Reinhardt Schwimmer, who, it is said, was really just a groupie type who liked to hang out with the Moran boys so he could impress his friends. The other five victims were true gangster types that were Moran members, including brothers Frank and Peter Gusenberg. Frank, with fourteen bullets in or through him lay still alive when police responded. When approached, he didn’t even wait for the question. “I won’t talk,” he said. He then said “Just get me to a hospital,” and also and lastly, “Cops did it.” He would die three hours after the shooting, not long after his arrival at the hospital, saying nothing more. 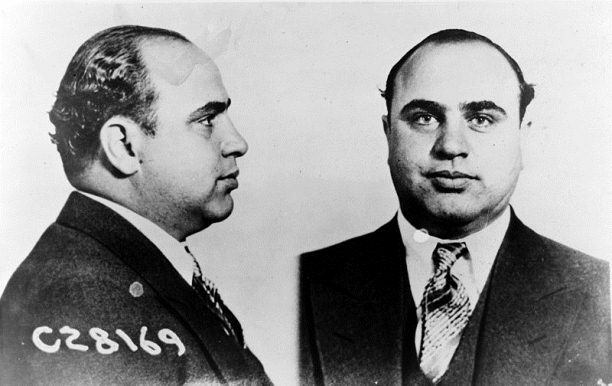 Although sitting in courtroom in Florida at the time, all fingers pointed to Al Capone. He would later be convicted of tax evasion, but, in reviewing history, no one was ever convicted of anything having to do with the massacre of the seven men at the garage. That in itself is really interesting, considering both tommy guns that matched the ballistics of the shooting were found in the home of a cop killer named Fred Burke. He went to prison for life for the shooting and killing of a policeman after an auto accident in Michigan and died there in 1940. No mention was ever made as to whether or not he was questioned about the massacre, or if he admitted to anything. A letter, discovered in FBI archives a few years ago may indeed have the answer to the who and why of the St. Valentine’s Day Massacre. A Chicago citizen named Frank Farrell had written a letter to none other than J. Edgar Hoover in 1935. 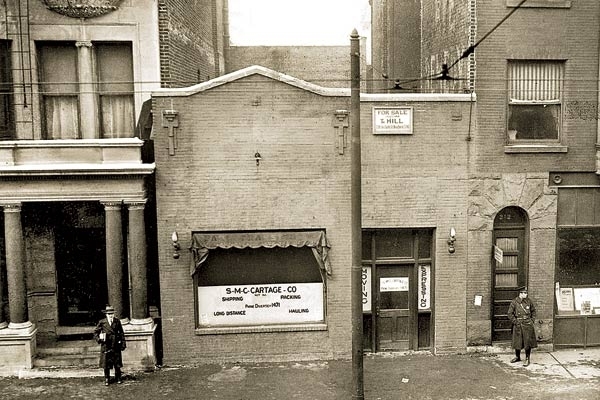 Frank wrote in the letter that there was a shooting in a gangster hangout restaurant on Clark Street in the 500 block in November of 1928 in which a man named William Davern Jr. was shot in the stomach in an incident, or fight involving the very same gangsters killed in the massacre. William was put in a car and driven down the street and dumped on the sidewalk. He made his way to a call phone and was brought to a hospital where he survived for a month. Before he died, he told his cousin William White who had shot him. So far, very interesting, but it gets even better; especially when taken into account that William Davern’s uncle was a Sergeant for the Chicago Police Department. Maybe Frank Gusenberg’s last words said it all. And maybe an elderly Chicago Police member retired to Florida.